Do the Hawks and Flyers Really Need a Goalie? | Five Minutes For Fighting Five Minutes For Fighting: Do the Hawks and Flyers Really Need a Goalie? The Chicago Blackhawks are one of the NHL’s elite teams. They are one of the youngest, most exciting teams in the league. They have the second most wins, the fourth most goals per game, the second fewest goals against per game, and the sixth best penalty kill. They’ve only lost two games when leading after two periods, one of which was in overtime. When you are as good as the Hawks are people will find tiny flaws in your team and then blow them out of proportion. That’s basically what hockey analysts are doing with regards to Chicago's goaltending. Chicago naysayers assert that a team as good as the Blackhawks cannot seriously hope to ride two unproven goalies like Huet and Niemi to a Stanley Cup victory. If the Blackhawks only had Cristobal Huet then I too would be befuddled that they didn’t make a deadline move. Huet has a good 2.38 GAA, which is largely attributable to the excellent team in front of him because he has an odorous .898%. I consider .900 to be the Toskala line. Anything sub-.900 and you’re venturing into Toskala territory. Thankfully for Chicago, they can play Antti Niemi as their starting goaltender. Niemi has 18 wins in 25 games, a .910%, 2.24 GAA, and 4 shutouts (almost 20% of the time he shuts out the other team). The problem is he’s young and inexperienced considering this is his first full year in the NHL at 26-years-old. But hasn't every proven goalie been young and inexperienced at one point? Furthermore, youth doesn't preclude a team from winning a championship. Cam Ward led the Hurricanes to a championship in his rookie season. Would the Hawks benefit from an upgrade in goal? Certainly. But how much of an upgrade should they get? Star goalies just aren’t available via trade until this off-season when the Sharks get rid of Evgeni Nabokov after another bad playoffs. Scotty Bowman's addition to the Chicago front-office gives them firsthand knowledge of the reasons why they don't need to acquire a goalie. Detroit has won the Stanley Cup three times with Chris Osgood as their goalie (Bowman was there for two of those). Chris Osgood is certainly not a premier goalie now, nor was he then. The Wings didn’t need to have a premier goalie to win the Stanley Cup because their team was just so good. Their defence was strong enough and their offence potent enough that Chris Osgood didn’t have to steal any games for the Wings, he just couldn’t lose any by letting in Toskalean goals. This is the same situation the Hawks are in. Their offence is loaded. But this isn’t the type of offence with one scoring line that can be shut down in the playoffs. They can afford to play Kane and Toews together because they can throw out a second line featuring Marian Hossa. The third line is capable of scoring as well with Kris Versteeg, Dustin Byfuglien, and Troy Brouwer. Andrew Ladd even has 15 goals as a fourth liner! The defence is just as good. Keith and Seabrook are the best tandem in the league and Brian Campbell is enjoying a nice bounce back season. In addition, Hjalmarsson, Johnsson, and Sopel are all solid players. The Hawks don’t need an elite goalie when the rest of the team is good enough to make up for any sort of shortcoming in goal (which judging by Niemi’s stats isn’t very much). The Hawks will be more than fine with their current roster. I think the Flyers are similar to the Hawks, albeit a little less talented. I don’t think they truly needed to add a goalie at the deadline either. The Philadelphia Flyers were in a serious predicament with their goaltending before the season began. They were pushed right up against the cap and had one glaring weakness, their goalie. They chose not to re-sign former pseudo-number 1 goalie Martin Biron and instead chose to bank on Ray Emery regaining the form that saw him take the Ottawa Senators to the Stanley Cup Finals in 2007. This deal was primarily financially motivated, since the Flyers cap space was non-existent and Emery was the best goalie they could sign for limited money. It’s easy to get a player to accept a lower salary after he’s accumulated a bad reputation for behavioural problems and also spent a year in Russian exile. Their gamble didn’t really pay off considering Emery put up pedestrian numbers while healthy (.905% and 2.64 GAA - also considered amazing post-lockout Leafs goaltending) and is currently out for the rest of the year with a groin injury. Emery’s injury has thrust waiver-wire pick-up Michael Leighton into the position as starting goalie on a playoff contender. Leighton has actually played fantastically for the Flyers. He has a 2.28 GAA and .924%, while going 15-4-2. All of this makes me feel even stupider for dropping him in fantasy hockey. The major rumour at the deadline was that the Flyers were pushing for Florida’s Tomas Vokoun. The deal never developed, the stumbling block apparently being Vokoun’s onerous $5.7 million contract and the Flyers limited cap space. Now, analysts are surprised the Flyers didn’t make a move for a goalie, but I don’t think Vokoun can be considered the answer. Certainly to get Vokoun the Flyers would need to deal a player with a large salary, such as Hartnell ($4.2 million), Gagne ($5.25 million), or Briere ($6.5 million) being the most obvious. The Flyers’ problem is that all three players have no-movement clauses and cannot reasonably be expected to waive them in order to go from a Stanley Cup contender to a perennial 9th place team. That leaves Jeff Carter as the most likely player to be dealt for Vokoun both because of his salary ($5 million) and obviously the desire Florida would have for a player of his calibre. Does it make sense for the Flyers to make this trade? No, obviously not. Carter is an integral part of the Flyers offense and the upgrade from Leighton to Vokoun can’t be more valuable. Plus, Vokoun is a goalie with merely 11 games of playoff experience, all of which accumulated in two first round exits. Is that the star goalie the Flyers needed? Avoiding this deal was the best move the Flyers could have made at the deadline. Another reason why I’m not entirely convinced the Flyers needed an upgrade in goal, besides Leighton’s stellar record, is that this is a team that made the Eastern Conference Finals with Martin Biron as their starting goalie in 2008. That year Biron’s numbers were worse than Leighton’s (2.59 GAA and .918%). Pretty good, but nothing spectacular. Is banking on Michael Leighton any different than rolling the dice with Marty Biron? Or should the Flyers have traded for Dwayne Roloson? Is he an upgrade from Leighton? Not by much. The Flyers are much like the Hawks. They have a tremendous group of forwards, most of whom are more than capable defensively. And their defence is led by Chris Pronger. The Flyers will be fine with Michael Leighton, as will the Hawks with Antti Niemi. Roloson isn't much of an upgrade over Leighton? Has Leighton ever carried a mediocre team to Game 7 of the Cup final on his shoulders like Roloson did with the Oilers? 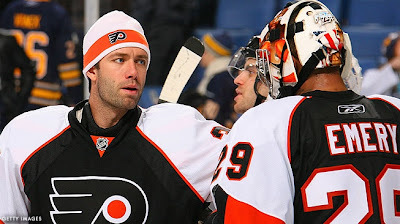 To say that the Flyers will be fine with Michael Leighton between the pipes in the playoffs is dumb enough, but to argue that they wouldn't be any better off with Roloson instead is just ignorant. I'm not so sure that Roloson would be a better bet. I agree that he was amazing in the playoffs... in 2006. There's a big difference between a 36 year old and a 40 year old in goal. In the same way you could say that the Flyers should've gone after JS Giguere, because of how he played in the 2007 playoffs, but that wouldn't be an improvement either, because he's no longer at the same level. Well, I guess the Flyers won't be fine now that Michael Leighton is out 8-10 weeks. I was looking forward to watching him prove me right over the playoffs. Well, at least now he can't prove me horribly wrong.